For consulting firms, one point on the triangle of trade-offs can drive enormous business gains. Which one? You may be surprised at which point on the triangle maximizes your consulting firm’s revenue. Most consultants crow proudly about their exemplary work. The combination of their unique, breakthrough processes, genius IQs, and millennia of experience guarantees unparalleled results for their clients. The answer to, “What makes you better?” hovers, ever ready, on the tips of most consultants’ tongues, eager to grab the megaphone when a prospect is nearby. 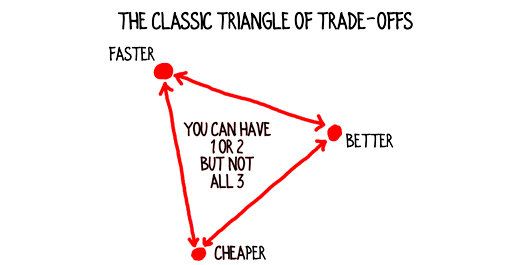 Unfortunately, Better occupies the least important point on the triangle of trade-offs. Irrelevant – Many clients perceive their project value as binary. You either solve the problem or you don’t. More solved carries little benefit. Indeterminate – Unless your project directly affects the client’s revenue or costs, the value of your project is a bit fuzzy, and the incremental value of your exceptional wonderfulness is even fuzzier. Suspect – Clients heavily discount the gap between you and competitors. When they factor in the likelihood of anyone succeeding, your performance advantage shrinks further. If clients aren’t hell-bent on buying Better, then what bangs their gongs? Faster. In particular, one manifestation of Faster: responsiveness. Sure, promising a superior solution is terrific, and offering a fee advantage vs. other firms may sway some prospects. However, responding promptly, from the very first moment of inquiry through closing the project (and beyond), outshines the other two. Why? Because Better might happen in the future, and Cheaper could serve the organization. In contrast, Faster, in the form of responsiveness, personally benefits your prospect now! For example, I’ve been working with a firm whose revenue per consultant is high. Sky-high. As in, six-to-eight times the national average for consulting firms. (For the record, that means they’re closing in on $2 million per consultant.) The CEO’s phone buzzes throughout the day with inquiries from prospective clients. They call, in large part, because the firm is known for extraordinary responsiveness. This firm wins on other fronts too, by being easy-to-do-business-with (they always say, “yes”) and leveraging an unusual pricing strategy. However, their core advantage is responsiveness. I could write out my own list of responsiveness best practices, but where’s the fun in that? Let’s work together as a community to build a responsiveness protocol for your firm. Post your thoughts in the comments section and I’ll add them to this post. The first best practice is from Anatoli, who guarantees he will return calls within two hours. Anatoli also (is going to) have a link on his card to an online calendar, which makes it easy to book an appointment with him. Cheryl is presenting more mid-project, interim reports, which allows her to quickly pivot if the project isn’t headed where the client wants. Paul is incorporating adaptive feedback mechanisms, which is pretty cool. What do you do (or would you like to do) to make your firm super responsive to prospects and clients? Rather than you can get only two of the three variables, the more appropriate interpretation of the triple constraints triangle is that one accomplishes changes in any particular variable by modifying one or both of the other two. There’s also a big exception in that improvements in quality when done right also can reduce both time and cost. 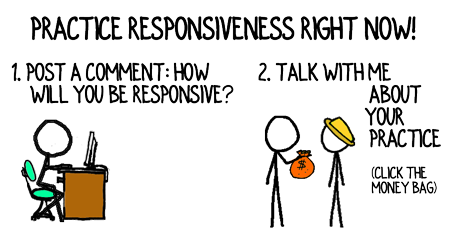 I’d suggest responsiveness is a form of better consulting. Strictly speaking, you’re absolutely right, Robin. For the purposes of promoting your consulting firm, however, the triangle of trade-offs is a useful framework to make the point: Responsiveness Rules.Given the choice between taking one hour each day to improve the quality of a deliverable or using that hour to be ultra-responsive to your clients and prospects, the latter will create happier clients and a larger firm. Thanks for adding your perspective. My business card states that I return calls within 2h on business days; and I do. My site has “Book time with me” page. My next card will have a link to this page. When it comes to development of proposals life gets more complicated. I am still working on the right balance between development of Context document and use of template proposals. Rapid call back is an outstanding way to demonstrate responsiveness, Anatoli. You can quickly turn around a Context Document and, if you do a lot of similar projects, pulling together a “custom” proposal rarely takes more than a few hours. Great input! I would side with @Robin about responsiveness – it is in the corner of “better”. Responsiveness comes in many forms – returning calls or emails promptly is important especially in the beginning, but during lengthy stretches of solution development responsiveness comes as staying flexible and responding to changing environment and priorities (which is in our industry is also known as “agile”). At the same time our attention to detail and ability to solve complex problems with robust solutions (that cost less in the long run but not the cheapest option in the beginning) make our delivery timelines longer – so regardless how responsive we are, our clients are not getting their problem solved any quicker. We cherish prompt responses to calls and requests but we are not pushovers when it comes to push for the faster delivery at the cost of quality of the solution. The experience with us does not stop at the delivery gate – the poorly developed solution will not make our client’s experience with us any better no matter how responsive we were during the sales process. Vadim, anything that improves the client’s experience could be considered Better. Cheaper is better, as is faster, as is improved results in the short term and the long term, as are many other attributes of a project. As a general rule, when you can deliver a solution faster that’s better for the client; though, that’s not always the case. All of that misses the point, as does the confusion between responsiveness and project timelines. When you’re highly responsive, it’s actually easier to extend the timelines as necessary to deliver an outstanding result. Separately, there is, fortunately or unfortunately, a gap between the theory of consulting–where the best solution is always appreciated most by the client, and the reality of consulting–where a satisfactory solution today is usually appreciated more than a superior solution tomorrow. Don’t get caught in that gap. The most successful consultants respond to the client’s reality. 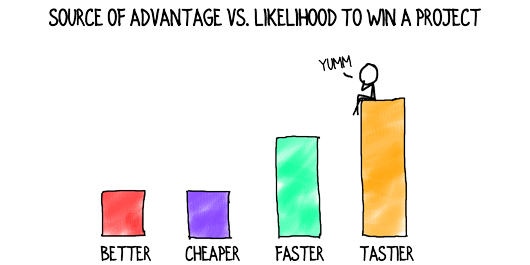 Faster is better in general, but it’s not the same as Better in the context of this post. Faster is about quick response, Better is about content. Seems like this topic has generated a bit of debate. Maybe it depends on they type of consulting you do but in my experience, it really is about Faster (though its taken me a long time to realize it). Faster, as in yesterday. Because we consultants are hard-wired to be perfectionists and “experts” we do get caught up in that trap and most clients simply want to move forward with a good solution, not necessarily the best solution. To answer your question, I’m trying to get better at responding to emails and phone calls, etc. But, also, presenting more interim results to clients, so they see the progress that is being made. It may not necessarily get the project done more quickly, but the client is more engaged in the process, and allows for pivots. Debate is good! Fabulous example of mid-project responsiveness, Cheryl. That’s a great example to add to the list. Following on from Cheryl’s observations, in both Lean and Agile (in the genre of process improvement), there is an (old) adage “fail fast” – what it really means is “learn fast”. In practice this translates as “don’t get it right, just get it out” …. but then actively seek feedback to come back with a second, third, fourth iteration. Actively seeking feedback (the learning bit in all this ‘failing’) is the important bit. However, you have to actually build this type of responsive, adaptive feedback mechanism deep into your consulting process – it isn’t something you can bolt on just by ‘answering the phone faster’. Exactly! Agile and Lean bothExactly! Responsiveness is more than quick turnaround time on calls and proposals–though those are definitely important and noticeable activities. “Adaptive feedback mechanisms” are one way to embed responsiveness into your consulting, and there are others too. I encourage all readers to think beyond the obvious and beyond the project. Responsiveness can pervade many aspects of your practice. Paul, thanks for the Lean/Agile injection into the discussion.